I've been a bit quiet on this blog the past few days. It's been quite an intense time, and I'll be posting more soon. My first couple of days were spent just getting my body used to being in another different time zone, several more zones away from home. (Kind of brutal, truth be told. LOL) Last night I had my first normal sleep. (Sort of.) Also, connecting with people and planning my itinerary for my time here. It's turning out to be a very busy time! Yesterday and the day before I was out and about, meeting with folks and capturing photos, audio and video. I will begin processing it today, so expect a barrage of posts in the next couple of days. He has invited me on his show tomorrow evening, along with Dmytro Potekhin, a peace activist who has been a guest on Nash Holos twice, once in January 2014 and again in Sept. after his abduction in Donetsk last summer. The reason he was in Donetsk was to research an article for Peace Magazine. You can read about his experience here. He joked with Roman and me about how he was "terrorized the terrorists" while in captivity. Less funny, but equally profound, was his comment about how dire the situation is in Ukraine when a peace activist advocates for arming his country. Enjoy exploring these links. I'll be back after I've processed some of my photos and A/V footage, which includes an interview with a Cyborg. Very excited about this seminar coming up sponsored by the Ukrainian Jewish Encounter: The Seduction of Propaganda and Mass Violence in Ukraine in Ukraine in the 20th and early 21st centuries. 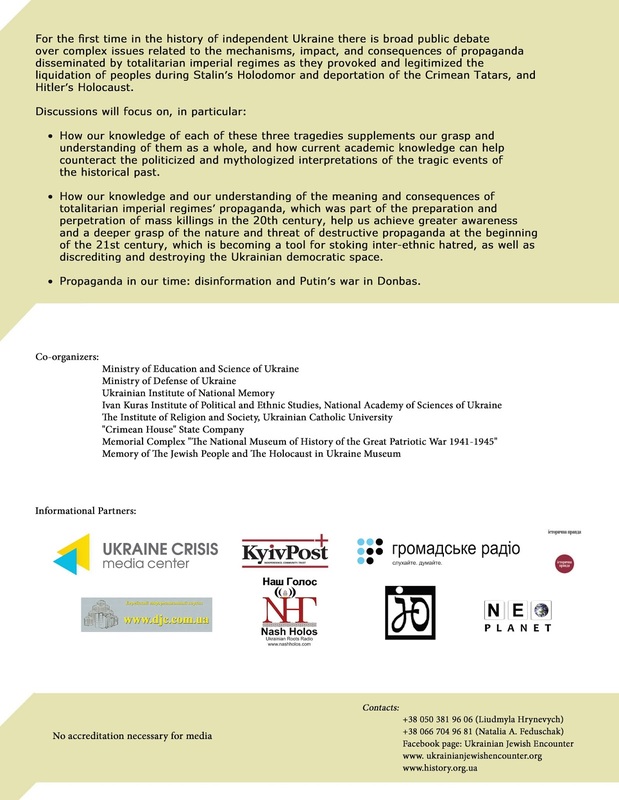 This seminar for an audience of 400 students, graduate students and young scholars will investigate the effects and consequences of propaganda used by totalitarian regimes within the context of the planning and implementation of three very different examples of totalitarian mass killings in Ukraine: Stalin’s Holodomor, the deportation and destruction of Ukraine’s Crimean Tatars and Hitler's Holocaust. 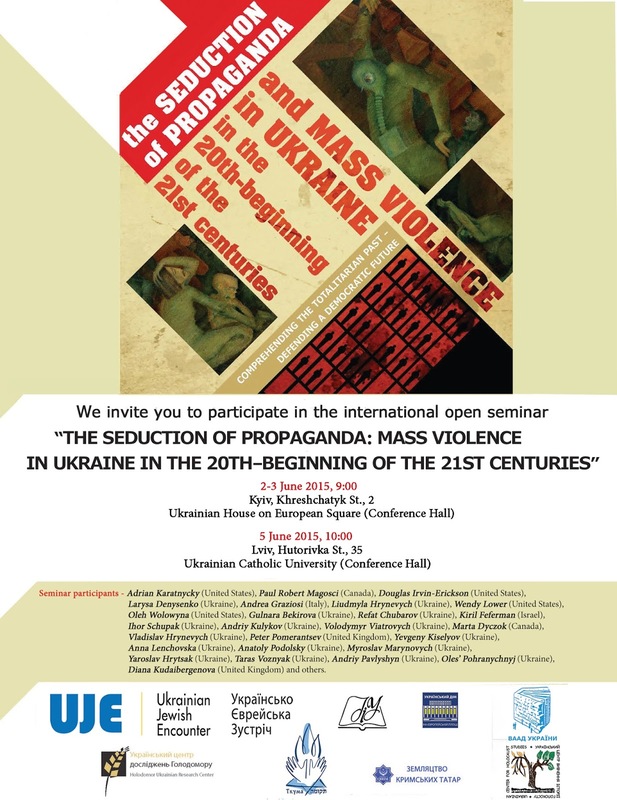 It takes place Tue and Wed Jun 2 & 3 in Kyiv and June 5th in Lviv. Stay tuned for photos and A/V updates. While in Toronto this past weekend I enjoyed a live in-studio guest appearance on Radio Kontakt, hosted by Andy Holowaty and Uliana Hlynchak. 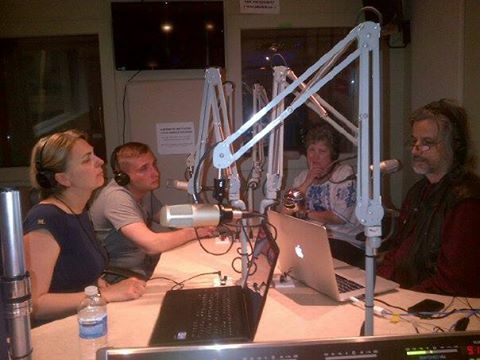 The show airs Sundays at 9pm EST on multicultural channel AM530. My fellow in-studio guest was Anton Sestritsyn. Anton just graduated from university in Ottawa, and was involved in the Canada-Ukraine Parliamentary Program. He is now living and working in Toronto, so I imagine he will be a frequent guest on Andy's show. Anton is an outstanding young man, full of energy and great ideas. I'm so looking forward to his contributions to the hromada as well as to the greater community. Anton was born and raised in Crimea, is now cut off from his homeland. I can't imagine how it would be not to be able to return "home" for a visit ... or any other reason, for fear of being killed or abducted. Love his new moniker: the Crimean Crusader. Radio Kontakt is a "half-napiv" program ... i.e., bilingual Ukrainian/English. Andy and his co-host Uliana always bring on interesting guests and indulge in fascinating conversations in both languages. If you miss the live broadcast, you can catch the podcasts here. And stay tuned to Nash Holos ... I'm looking forward to having both Andy and Anton on the show when I get back from Ukraine. On Sunday afternoon went to the David Dunlap Observatory in Richmond Hill, ON (suburb of Toronto) where Ukrainian astronaut Dr. Yaroslav (“Yarko”) Pustovyi was a guest speaker at an event put on by the AstroNuts Kids' Space Club in Toronto. Dr. Pustovyi then came to Canada as a team member of Canadian Arrow, a privately funded rocket and space travel project designed to take the first civilians into space. The Arrow's original six X-Prize Astronauts included several seasoned military pilots. 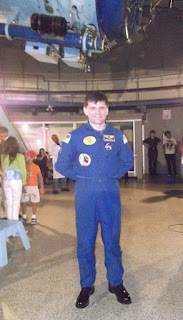 Dr. Pustovyi was the only member of the team with actual space training. Dr. Pustovyi now lives in Barrie, Ontario, where he is co-founder and Vice President of Space 1 Systems Inc., a commercial spaceflight company, and the President of the Canadian Space Commerce Association. In his talk for the kids at the Dunlop Observatory, he said that nowadays anyone can be an astronaut. All the technology that powers rockets is now in your smart phone! To succeed at reaching your goal to be an astronaut just requires determination. Second day in Toronto: Saturday May 23rd, staying with great friends and being pampered, entertained and stuffed to the gills with awesome food! During the afternoon, I was treated to part of a live performance by the Canadian Bandurist Capella. This was a "dress rehearsal" for the next day's benefit concert for Humanitarian Aid for Ukraine in Kingston. I'm on my way to Ukraine again and will be blogging this trip. I hope you'll find my posts interesting and please feel free to comment. I will be moderating comments, however, and only comments that adhere to the rules of common courtesy will be published. On my way to Ukraine I'm stopping a few days in Toronto. The flight on Air Canada was uneventful ... delayed (not surprisingly) out of both Nanaimo and Vancouver. Despite being stuck in a middle seat again, on a full flight, it was a comfortable enough ride. The seats had little headrests on either side, so I was even able to nod off for a bit without killing my neck too much! For some reason I decided to check out the in-flight movies. I seldom do that, preferring to read my Kindle or nap. But on the this trip I scrolled through the movies and chose American Sniper. I'm not sure why. Or if it was a good idea. My initial thought is well, I'm going to a country that's at war. I suppose I should get into that headspace. It certainly got me that. The movie lives up to all the accolades, and more. It was gripping. My heart pounded. I gasped out loud. And at the end, I cried. And I cried. Sobbed like my heart had broken. It drove home the reality of life for ordinary people, like me, where I am heading (Kyiv, Lviv, and Dnipropetrivsk) and what is happening there to living, breathing, loving people. It made me FEEL the insanity, the horror and the despair of war ... more strongly than I ever did before. And it made me despise, more deeply than before, the depraved notion of "the glory of war" ... which I heard uttered (to my abject horror) many years ago by an officer at a military banquet. This movie is brilliant, not least of all for the way it depicts and draws you in to the horrible reality of war, making you feel as deeply as it respects your intelligence. And, perhaps, challenges it. IMHO, this move deserved every Academy Award it was nominated for. 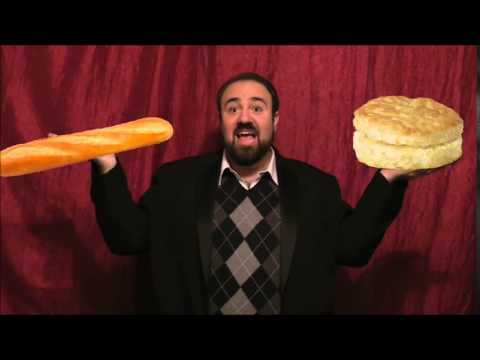 A travesty that it only got one (for Best Sound Editing).